Made up of trained craftsmen, the Mission Kitchen and Bath family works with our customers to help create the space residents have always dreamed of. With a Certified Lead Carpenter, Certified Kitchen and Bath Remodeler, as well as an Interior Designer on staff, our clients can trust that they are getting comprehensive top quality work, every single day for every single project. Mission Kitchen and Bath is also an active member of the Kansas City chapter of NARI, as well as a part of the Better Business Bureau of Kansas City. Our certified kitchen and Bath remodeling project managers go above and beyond to walk you through every step of your project’s process. Starting with clear and precise proposals, our experts are the first people you will interact with while starting your project, and then the last you will see as the finishing touches and upkeep are put into place in your new space. Unlike traditional salesmen, we stand by your side through your entire experience, ensuring seamless execution. With unparalleled commitment, our project managers are unlike any other remodeling team in the business, putting the client above all else in everything they do. In fact, we believe in our team so much that we guarantee our craftsmanship for two years. Thanks to this and our promise to only use the highest quality of materials available in the building industry, the Mission Kitchen and Bath difference shines through in our work, providing you with a beautiful remodel that adds both value and style to your home design. 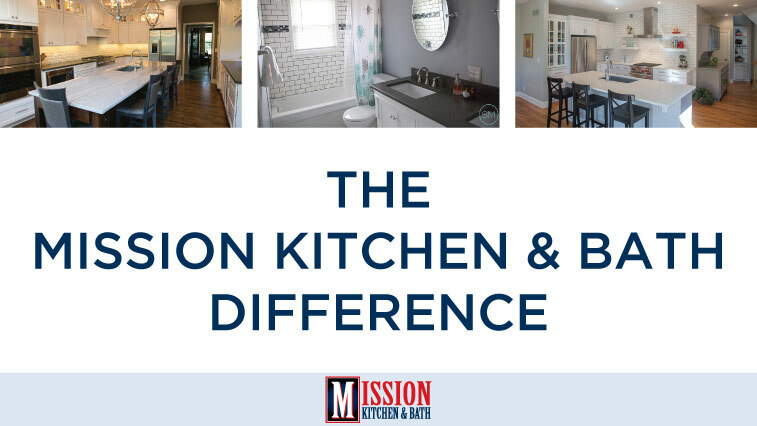 The Mission Kitchen and Bath difference is simple. With certified experts who walk you through every step of your project, quality products made with your best interest in mind, and guaranteed fulfillment, we are able to exceed even the highest of standards with every project. After all, our mission is your satisfaction.